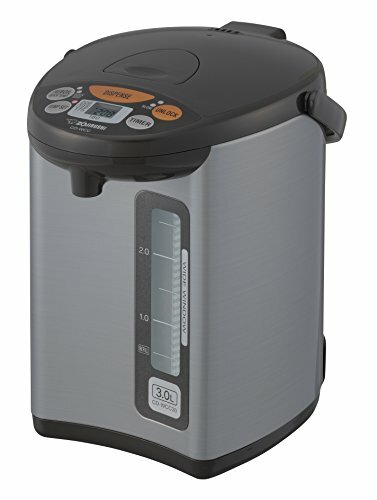 Zojirushi Micom water boiler and warmer has a micro computerized temperature control and a one-touch electric dispensing system. It has four keep warm temperature settings: 160, 175, 195, 208 degrees F. This unit displays actual water temperature at all times. It is also has an energy saving timer function (6 - 10 hours) and easy-to-hear sound indicator to alert completion of boiling process or low water level. Quick temp mode heats the water directly to the selected keep warm temperature without reaching a boil. The water will reach the selected keep warm temperature quicker than regular mode. Other benefits include reduced steam and reduced energy use. This mode should be used when dechlorination is not necessary, such as when using bottled or purified water. To activate, press the reboil/quick temp button; the boil light blinks.